This was posted to the Men’s Rights subreddit the other day, with the headline: “Saw this today and I suppose that’s where we’re headed.” It’s gotten 556 upvotes, last I checked. (Those are net upvotes: it got 848 upvotes, 292 downvotes.) This is the world that a lot of MRAs, and Redditors in general, think they live in. The delicate balance that commands us to punish rapists while not punishing the innocent is extremely serious business. We need more sober, more adult, more serious voices to be part of the public discourse. The last thing we need is more Chicken Little hysteria, no matter which side it’s coming from. I’m guessing the upvotes he got for his comment must have come from visitors from his blog, because up until he posted that comment the few dissenters were mostly being dismissed. The Men’s Rights subreddit: Waxing hysterical about imaginary oppressions since March 2008. Pecunium, thanks for the info, I was rather doubtful he’d really invented anything special. So anyways, I’m gonna start selling tshirts that say “sperm jacker” on them so that we can avoid MRAs in public. Anyone want one? I don’t know if a “sperm jacker” t-shirt would repel MRA’s or attract them. 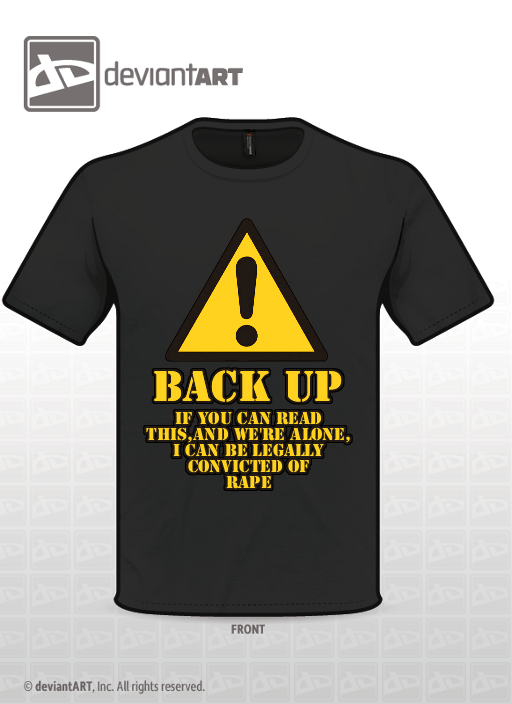 It would have to have a disclaimer “This shirt is just a joke. Do not offer me free sperm”. GingerSnaps — squee! *rat claws* I discovered her right around when the book came out, so Bonnie Tyme Pyrate is but an old school reference to me unfortunately. Took my mother to her concert a couple months ago and my mother enjoyed it, spreading the plague to my mother, w00t! But it’s not free sperm. It’s sperm that I’ve stolen to get saddled with a baby and a man that I don’t want! Because I’m just DYING to trap poor, unsuspecting men in my web of child support and joint custody. MUAH HA HA!